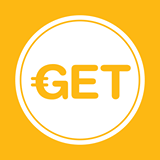 GET is android mobile app that allopws user in India to earn rewards, like free recharge or free minutes, instantly and simply by viewing video ads and visiting the advertisers page. For Tata Docomo user, for one ad view and/or visit to sponsor brand’s page, you will earn one free minute for calling local or STD numbers that can be used while in home circle, only. Minimum talk time of RS 10 (depends on operator). Tata Docomo users to get 60 seconds of local / STD talk time for watching each ad. 10 Rs for 40 Ads is very low.